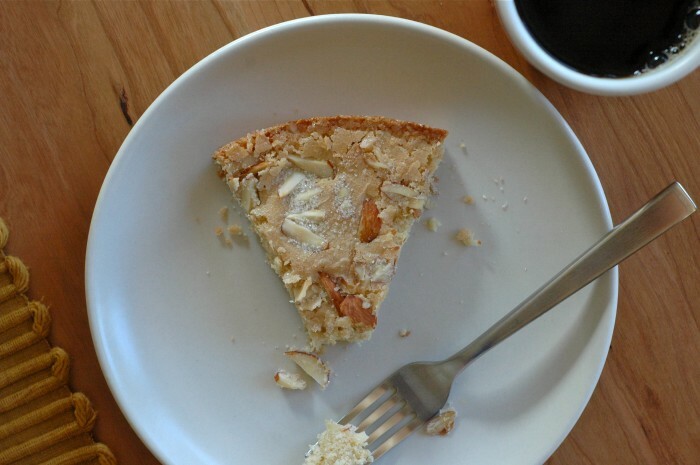 This Swedish Visiting Cake has not only the most charming name but also a deep almond flavor, crisp top crust, sprinkling of toasty almonds and brief list of ingredients. But nonetheless, I would like to start with that name. The recipe comes to us from Dorie Greenspan, who got it from her friend Ingela, whose mother and friends used to prepare this cake regularly for one another. 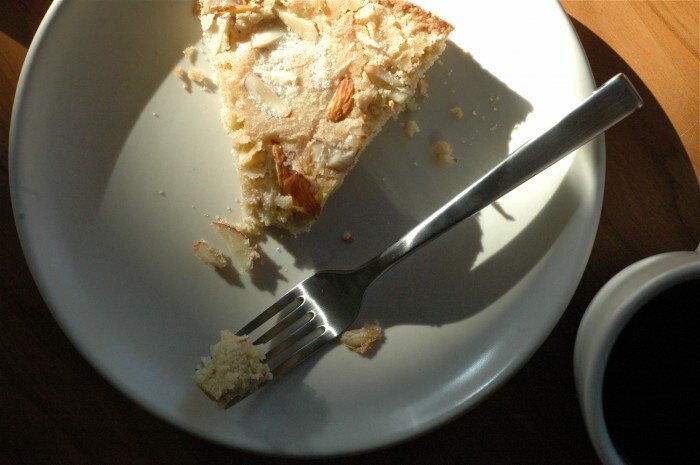 According to Ingela’s mother, it can be started when you catch a glimpse of guests coming up the road and pulled from the oven by the time they settle down for coffee. I love that. I love the idea of guests wandering up the street, of friends dropping by for coffee unannounced, of the kind of hospitality that includes cake. I have been thinking about friendship and community a lot lately, being new to this place and having very little of either one. I grew up in a state far from my extended family, but my parents surrounded us with a wonderful community. We spent holidays with our closest family friends and threw parties for birthdays. Meals were passed when times were rough. Friends knew about one another. My childhood was filled with people who weren’t related to me by blood but loved me just the same. I didn’t understand what my parents had given me until college, when I was awakened, intellectually speaking, to the concept of community by dorm living and the enthusiasm of the school’s student life division. I was convinced: my senior year, I moved into a drafty old house with six other girls. We shared groceries and split the chores and hosted dozens and dozens of people for pancakes each Saturday morning. After college, establishing community was harder. I gradually assembled my people, groups and individuals and families I’d met in various, often unexpected ways: an acquaintance whose romance failed at the same time as my own (we bonded over analysis of the situation and a shared love for big red wines), a housemate of the subject of said failed relationship, a friend of that friend who I met at a party (and who eventually designed my blog’s logo and approximately 97 percent of everything related to our wedding), a girl from my hometown who moved to my city at just the right moment. I clung to them. I was living alone, and sometimes, of course, I felt lonely, but I had people. I had friends to call when I was blue, I went to gatherings and parties where we’d eat or dance or head out on the town, my neighbors watched out for me, I shared fears and ambitions over mugs of coffee and glasses of wine, we cooked in our kitchens, we dined at restaurants all over the city. And when Ben and I got married, I literally saw my community, our community, for the first time. It was right there, the tangible manifestation — in front of us as we made our vows, around long tables and across the dance floor at our reception. That assemblage of people who didn’t necessarily know one another, the individuals who had pulled me through every difficult season of my life to date, the people who knew me to my core — and next to them, Ben’s people, and next to them, the ones we shared. The image is burned into my mind, a fiery reminder of how lucky, how blessed I am. I don’t think I had realized. The sight made the leaving harder, but I wouldn’t trade it for anything. So here we are, far away from everyone we’ve ever loved. I know we’ll make friends, I know it takes time, I know we’ll look up one day and realize we have a tangible, right-here community once again. But I keep wondering, what do we do in the meantime? And this is what I’ve come up with: we do what we’ve always done, really: cobble it together. We have those same dear friends and family, though now far away, with relationships maintained through emails and texts and Facebook messages and even five-word comments on Instagram (I take it all). Others have been in different cities for years, and our long-distance relationships are already well rehearsed. (Take, for example, the friend with whom I have the best extended texting conversations, prompted by such things as articles that upset us and trips to the laundromat.) There are friendships being formed in this new place with people who were just acquaintances in other seasons of our lives, and for those I’m deeply grateful. And there are, to my surprise, people out there on the Internet (you lovely people! ), like-minded strangers I’ve connected with through this blog. Our neighbors are kind, and perhaps there’s even something to the now-familiar faces of those who run around the lake at the same time I do in the mornings. And Ben and I have each other; I’m never without a dinner partner, a fellow adventurer, a friend. And so in the meantime, there is that. And in the meantime, I wait. For the day when I can throw a big party. For the first time I see guests wandering up the street, dropping by on a whim. I can tell you this much: on that day, there will be cake. I know I just gave you a recipe for another cake from this very cookbook, but I can assure you that the two are quite distinct from one another and both worth sharing. I hope you’re not offended! 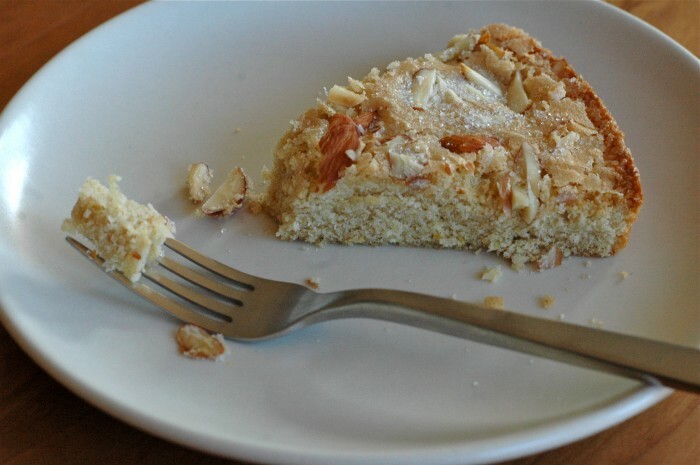 The interior of this cake is soft and dense, with a consistency not unlike that of shortbread. Its top crust is perfectly crisp, the sugar crackling with each bite. 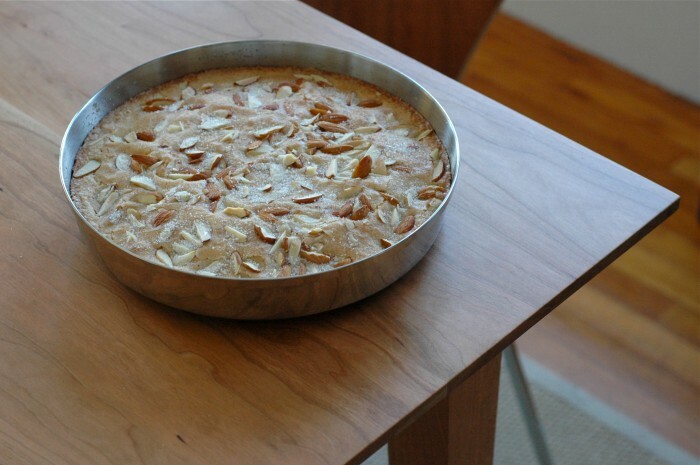 The almond flavor is assertive — the cake’s taste and texture are similar to those of a cake made with almond paste. It is wonderful fresh from the oven, but I think the flavor may be even better on the second or third day. I chopped my own almonds, and if you do the same, be sure to chop them finely so they become thoroughly toasted in the oven. Preheat the oven to 350 degrees. Butter a seasoned 9-inch cast iron skillet or a 9-inch round cake pan. Pour the sugar into a medium bowl. Add the lemon zest and, with your fingers, blend the zest into the sugar until the mixture is moist and aromatic. Whisk in the eggs, one at a time, until well blended. 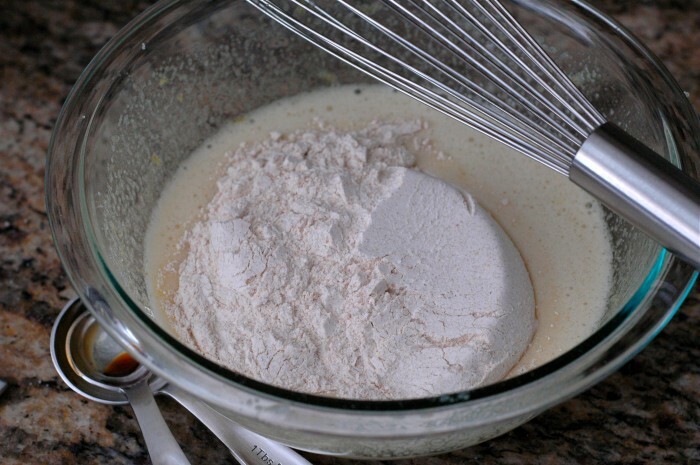 Add the salt and extracts; whisk well. With a rubber spatula, stir in the flour. Then, fold in the melted butter. Scrape the batter into the skillet or pan, smoothing the top. 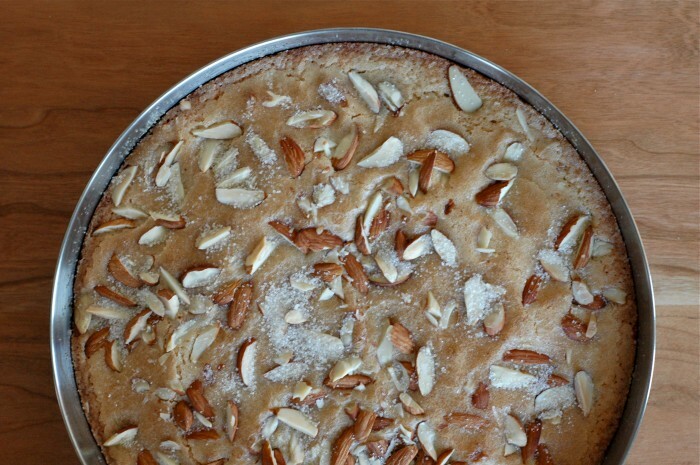 Scatter the almonds atop and sprinkle generously with sugar. Bake the cake for 25 to 30 minutes, or until it is golden brown and a bit crisp on top; the inside will remain moist. Remove the cake from the oven and let it cool for about five minutes. Run a thin knife around the sides of the cake to loosen it. 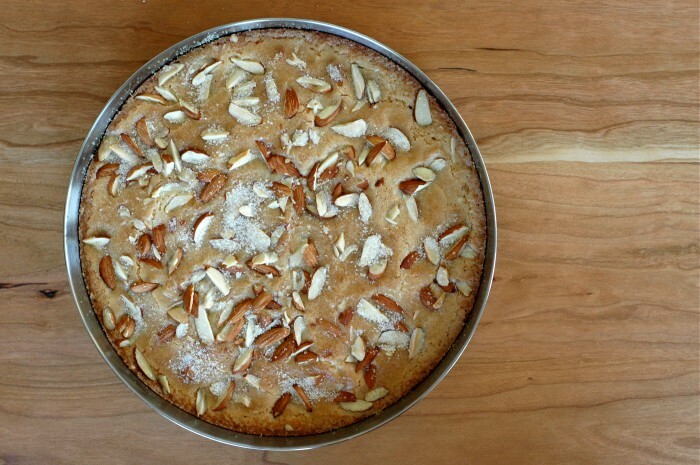 Serve the cake, warm or cooled, directly from the skillet or pan or turned out on a serving plate. Some wonderful, new friends are out there, and won’t they be lucky to enjoy your baking! The cake looks lovely, and delicious – but beyond all of that, thanks for sharing. I’m glad you and Ben are here! Its a pleasure to hear your thoughts in this process. I think it’s so fair to ask, what to do in the meantime. It is certainly an in-between. Your new community will be coming over often as soon as they know what kind of great treats come out of your kitchen! Thanks, Sara — you’re so sweet. It is harder meeting people when you first move, but I’ve found that hanging out outside your place (for me that’s been gardening and such) somehow lets people know you’re there and they enjoy talking as they pass by into their houses. I wish I could come over right now and enjoy this cake with you! I would happily invite you in for cake and coffee! Maybe one day. :) By the way, I loved reading your comments on your own neighborhood in your last post. Adore the story behind the cake! I can’t even imagine “dropping by” for coffee. How did we all get Soooo busy? Such a scrumptious cake to share and bring delight to the new season of autumn! It’s a lovely story, isn’t it?? And yes, a good reminder to slow down. This is a lovely story! Is there any way to print it? Everything I’ve tried comes out a bit “wonky”.